Home|Floral Library|Primrose – Primula spp. Decorative Life: 2-4 weeks or more, depending on use in the garden or indoors. With P. vulgaris ‘Dania Skarlagen’, unknown production factors induced from 8 to 100% plant and flower collapse. One possible cause for this collapse is fungus gnat larvae. Members of the Primulaceae (primrose family). Depends on species, from China to New Hampshire. Common relatives include cyclamen, shooting-star and loosestrife. Genus classed as a dicotyledon, leaves not parallel veined. Flowers are rounded 1-2 inches across, in various forms of clusters held above foliage. Leaves usually form a clump, often lighter green in color. Many species and cultivars have significant fragrance. Holding plants at 55F produce much better results than holding them at 68F. One species grown as a potted plant is P. obconica, also known as Poison or German Primrose. Indeed, some people are allergic to its leaves resulting in skin rash and itching. 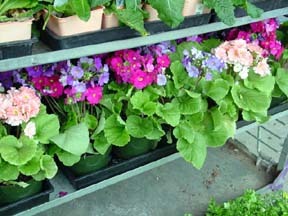 The name Primula is a diminutive of “primus”, referring to its early blooming. One species, P. veris, means first of the spring, in reference to its flowering. The commonly grown P. obconia has been shown to cause contact dermatitis related problems with some individuals. Will generally do well in light levels at least bright enough to read a newspaper in comfort but more light would be better. One favorite cultivar of P. acaulis and its respective flower colors include ‘Pageant’ (many bright colors).